This week we will be learning about the crystal clear healer: Quartz. I was given the option between magical Labradorite and the cleansing power of Clear Quartz. My Heart immediately sunk into a gracious sigh of relief when Amanda suggested Quartz. I had naturally been drawn to it over my time with Fluorite (the featured stone of our first Rock Talk). I took this as a message that a focus on healing and clarity were necessary for this second entry. 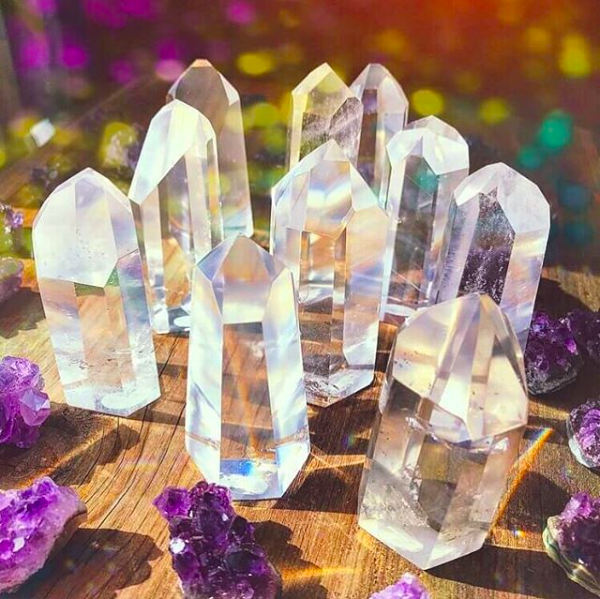 A few of our favorite sources to do crystal research include The Crystal Bible by Judy Hall, The Pocket Book of Stones by Robert Simmons, and The Crystal Healer by Philip Permutt. One of the earliest steps in the process of writing one of these posts is the research. To start, I ask myself what my first impressions of this particular crystal are and how does that align with the information already out there. I noticed this crystal is more focused on the Spiritual/Metaphysical and the Physical realms, whereas Fluorite was much more concerned with healing our Mental and Emotional connections. While all crystals have various properties in all realms, it is interesting to note their favorites. Personally, my favorite realms to spend time in are the Mental and Spiritual. I will be the first to admit I find challenges when it comes to expressing my emotions or remaining grounded. So last month, I was asked to work on healing my mental health and its connection to my unhealed, unconscious emotional patterns. It has been incredible to watch my life unfold as I take responsibility for how I feel about a situation or environment by standing up for myself, honoring my feelings, and asking for what I want/need. This month my lessons were to begin understanding the deep connections between the Spirit world and the physical world we live in. The intention I consciously chose for my Quartz is Clarity. Conscious, decisive, heart-felt Clarity became the mirror of my world. This was not consistently an easy task. Healing takes accountability and contemplation of the very Shadows that exist within our depths. These are much easier to run from, to ignore, to drown with alcohol, but with faith in Spirit and love of ourselves, we can watch ourselves transform. Unlike Fluorite, I did not find my Quartz with me in every moment or situation. This was partially because I chose a cluster rather than a pocket stone but I also believe that the healing I was being asked to do was not something I needed to be focused on at all times. When the work goes deep, it is healthy and often necessary, to take a step back from the work and rest. I witnessed this naturally happen over my course with Quartz. There was one particular message that seemed to echo over this month and that message concerned the truth of our human form being deeply connected to the Divine. I took this message to heart as I focused with Clarity on my own conditioning patterns that denied any part of this truth. Clarity is a gift of working with your intuition. Based on my self-study, I understood that my intuitive guidance was carrying deep wounding before I received this Quartz assignment. “Be gentle,” echos in my ears from my best friend as she voices her concern when I am very clearly being unkind, from Amanda who whispers softly to Copper behind me as we work amongst the healing energy of the crystals. “Be gentle!” my Quartz rather screamed at me as I sat down to do my crystal practice. During a rather emotionally chaotic and distraught moment of thinking, there it was, a small piece of my Quartz cluster, disconnected from its original form. How it felt for me: as if a very clear pattern was being forcefully ripped out of my awareness. It hurt, I had to look at it, my Quartz and Spirit were sure to make me see. Have you ever stared at yourself in a mirror at night with only a few candles lit? You should try it. I have seen unfathomable things inside myself in those Shadows, but in witnessing them, I experience deep compassion for myself. Last night was no different, I sat before my mirror, broken Quartz offered to Spirit to heal and transform, and I stared. I watched the light flicker from demon to goddess, from Shadow to Siddhi, and back and forth until a deep sigh allowed for Acceptance and Transformation. “Be Gentle,” my Heart whispered as my attacks came marching in. How could I have been so careless? How could I allow this gift of Quartz to break? I listened to that critical voice, allowed it to be heard and patiently listened for it… that gentle voice of affirmation. As I sat and contemplated, I looked to the worksheet I created for you to practice with your own Quartz and there I had listed some possible messages your Quartz might be giving you. One in particular hit me right in the space that was asking to be healed: maybe you are experiencing intensified feelings which your Quartz would like to address. YES, actually. I did not expect that to be my message. I sort of added that specific suggestion as an afterthought, but apparently, it was really a deeper message I had hidden for myself within my work. How cool. After all of this, I was able to sit in the silence of my mind and soon felt guided to do a tarot practice. Maybe it was time to commit to yourself, as Karen Neverland so beautifully reminded me the night before, maybe it was simply time to fully embody what I am experiencing in my heart, to embody the Light of Grace that resides within me. I reached for my Sacred Rebels deck but then thought, maybe that is not actually the deck my intuition is asking me to work with. So I laid out each of my three decks, closed my eyes, connected to my right hand as I hovered over my three options, back and forth as Amanda would when she’s choosing the crystal for her daily practice. When I opened my eyes, I was astonished to be guided toward my Black Moon Astrology deck, the only deck I have purchased for myself. I looked up an Aquarius New Moon spread and landed on an adorable, quirky, somewhat silly looking one from 2017, but the message really resonated, so I went with it. Again the affirmations came streaming in. A reminder to remain grounded emotionally by my creativity, to continue practicing my art, my craft, sharing them with others along the way. A reminder to enjoy being a Divine being in a physical body, to celebrate that fact by allowing my roots to fully plant. A beautiful message after a day of making room in our home for the most wonderfully gorgeous little bedroom yucca. Quartz is a stone whose main purpose and intention is to ground the Spiritual into the physical realm. It is a powerful stone because its clear color gives it access to all of your chakras. There is no Shadow this stone cannot touch and, as I learned, it will. If there is a wound, Quartz will reach out to touch it. It is powerful yet gentle. It sees all, nothing is hidden from its healing. Intuition is always gentle even if every now and then it needs to scream at you to get your attention. The screaming will subside as you allow it to be heard and you will then have access to what the voice of your unique intuition really sounds like. I feel my Intuition in my Heart, in its intention and power. I feel it in my openness and vulnerability. I sense it in my solar plexus. I notice it as I release my critical nature and make room for the sense of farsightedness. I feel it in my gut. I feel it in my aches and pains and in the softness I have learned to extend towards them. The voice of your Intuition is probably much different than mine and I would be curious to hear how others have learned to listen to their intuitive voice. I am grateful to this practice, the gentle guidance of this blog to allow me to tap into my own and share the discoveries with all of you. A fun realization I had over my time with Quartz was allowing it to amplify other stones. In the beginning, I was drawn to use it alongside my Fluorite, hoping to continue the lessons in Discernment I had already begun, maybe this time with deeper Clarity and Self-Knowing. Ironically, my Fluorite parted from me over this month. This happens. Crystals come and go, like all healing, they are not ours to control. As I was nearing the end of this practice with Clear Quartz, preparing to share it with all of you, I noticed a bit of color sneak back into my space in the form of a piece of raw Rose Quartz and Orange Calcite. As I made a mental note, of the brightness of these colors on my Altar, I pondered what stones had made themselves present the last month. It was curious because most of them were dark colors, black stones being associated with the root chakra, grounding our physical body. How beautiful, considering much of my healing dealt with this specific need. A Reiki healer I met this month gifted me Shungite to cleanse my water, my body, to protect me. Amanda handed me a piece of Dalmatian Jasper saying it looked different than the others inviting my Quartz to now amplify my inner youthfulness. My Quartz cluster and a small Amethyst cluster have spent a few weeks together, really enjoying their time urging me to celebrate the habits of sobriety I am slowly, yet surely forming. And slowly, toward the end of the month, color came flooding back in. All of a sudden my Quartz could not part from its Rose Quartz orb friend, asking me to bring more rose into the space, our flower vases overflowing, rose oil becoming my new perfume and acne healer. With the messages affirming that my creativity was crucial in continuing this healing journey, my Quartz was thrilled to welcome the new additions of raw Rose Quartz and Orange Calcite - further reminders to remain gentle and loving. 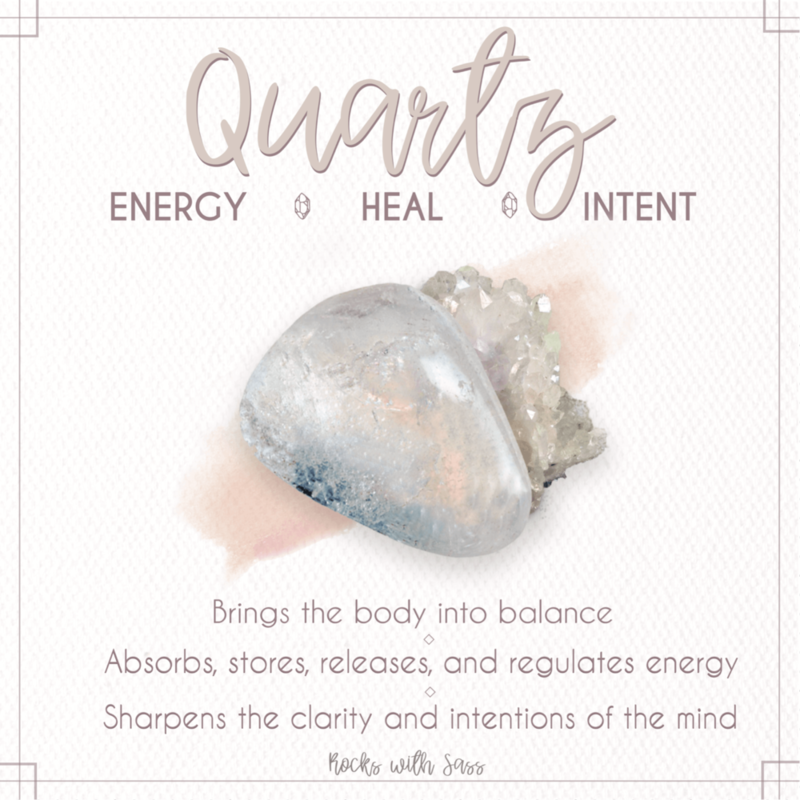 I would suggest Quartz to almost anyone, it has allowed me to access a deep trust in myself that I was wondering whether I would ever feel. A reminder, too, that Quartz is abundantly found on Earth so she’s already asking you to heal. The question is are you listening gently with intention? I have created a little worksheet for anyone who would like guidance on working with Quartz. I urge you to have fun with it. One of the biggest lessons I learned about healing myself this week is that I needed to release the control of the experience over to Spirit and my Quartz. As I did, the more I tapped in, the more I learned. We would love to hear about your experience working with Quartz and all of the ways our blog has helped you gain Clarity.